Whew! That title is a mouthful! Nevertheless, you'll be happy as all get out to have a mouthful (and then some) of this pie! It was a new creation for me that I made for my son's twelfth birthday earlier this week. We'll be having his big party this weekend, but I wanted to make him a special dessert on his actual birthday. He's not a big fan of cake, so I knew I wanted something a bit different. 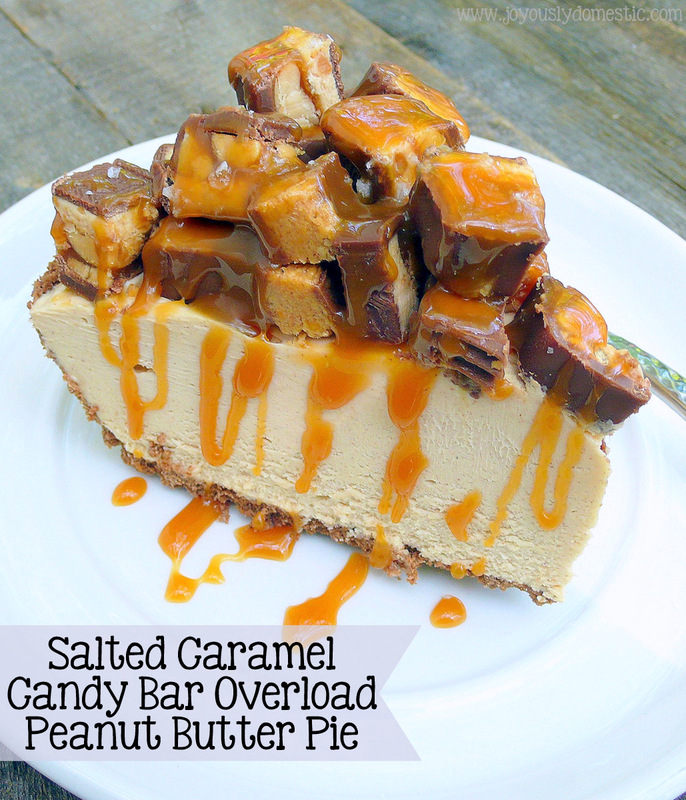 Enter this over-the-top frozen peanut butter pie that I piled high with chopped Snickers and Reese's Peanut Butter Cups, then drizzled with salted caramel sauce. It's not a super traditional peanut butter pie that is usually pudding-based. It's a tad bit thicker and more dense. And, the addition of cream cheese gives it a little tang and helps cut through the sweetness. I guess it could be considered a peanut butter cheesecake, but doesn't have to be baked and isn't quite as heavy. I cheated took some help from the store by utilizing an already-made chocolate pie crust. However, you could make your own if you want by combining a package of pulsed chocolate sandwich cookies with a few tablespoons of melted butter. Just press the mixture into a pie plate. Most any type of candy bar would work here - it's purely about preference. 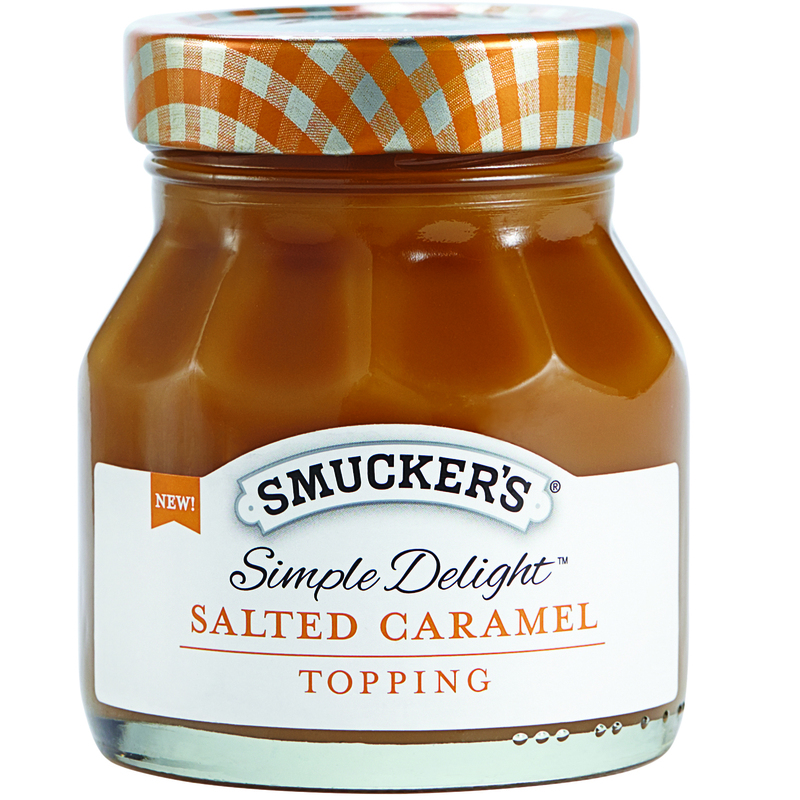 I used something new from Smucker's in this recipe - their Simple Delight Salted Caramel. I love this stuff! You'll be tempted to gobble it up by the spoonful - it's that fabulous! It's a bit thicker than traditional store-bought caramel sauce so it works well for topping desserts. In a large mixing bowl, whip together with an electric mixer the cream cheese, whipped topping, peanut butter, vanilla extract and salt on high - about two minutes. Reduce mixer speed to low and carefully add in the confectioner's sugar - a 1/4 of a cup at a time until combined. Increase speed to high and beat for another two minutes. Spread into a prepared chocolate pie crust. Place in freezer for, at least, three hours. (Overnight is best.) Chopped candy bars can be added on top when pie is first made (prior to freezing) or at time of serving. Remove pie from freezer about fifteen minutes prior to serving. Slice, plate and drizzle each piece with desired amount of salted caramel at time of service. Top with a pinch of coarse salt if desired. NOTE: I prefer this pie served from frozen. However, if you'd like a fluffier consistency and a thawed center, allow to sit out on the counter for about an hour prior to serving. Or, the pie can simply be refrigerated overnight prior to serving.